The concept behind Crescent Village’s high-density, eco-friendly neighborhood emerged as developers, design professionals, the city, and neighborhood residents collaborated to create a vision for a sustainable development in northeast Eugene. Today, Crescent Village is a vibrant, urban neighborhood that, in addition to upscale residences, offers restaurants and local small businesses a place to connect with the local community. “In the early phases of Crescent Village, neighbors welcomed the day spa and salon and local restaurants offering Northwest flavors and international cuisine,” says Teresa Bishow, an urban designer and the Crescent Village Association manager. Over the years, Bishow notes, the area’s businesses have grown to include a medical clinic, physical therapy clinic, financial services, real estate and mortgage companies, headquarters for a call center, and a local development company. “On the drawing board is a new medical building, which will include the first dental office in the village, and 256 new apartments in four-story buildings,” says Bishow. The village offers a multitude of living spaces that range from row houses and townhouses to loft-style apartments and contemporary urban apartments, all located within walking distance of restaurants and shopping. Currently, Crescent Village boasts 102 apartment homes and lofts, with more than 30 unique interior designs that range from 484 square feet to 1,483 square feet. Amenities include granite slab counters, dens, oversized private balconies, bistro or breakfast bars, and master bedroom suites with spa tubs, just to name a few. Another option is The Tennyson at Crescent Village, a community of 262 flats and loft-style apartments with public amenities such as a dog park, dog wash station, and brew stations, and apartment amenities like stainless steel appliances, vaulted ceilings, hardwood floors, and more. Crescent Village was also designed with sustainability in mind, and it was named a Green Building Demonstration Project by the City of Eugene. Its numerous eco-friendly features include nontoxic interior paints, landscaped bioswales that filter out pollutants from storm water, and energy-efficient windows. In the heart of Crescent Village is The Inkwell, a five-story mixed-use office and retail building that incorporates green building features, notably an innovative, energy-efficient use of groundwater to help heat and cool the building, as well as a windows designed to control temperature and light. “The Inkwell is a LEED Gold certified building, with The Inkwell Medical Group and the entire 4th and 5th floors receiving LEED certification for interior tenant spaces,” notes Bishow. Overall, Crescent Village is a unique community that offers people the ability to live, work, and shop all in one place, allowing residents to avoid long commutes and rely less on their cars. Bishow mentions how over the years communities have really embraced what is considered “new urbanism” or “smart growth,” which promotes providing a mix of land uses at densities that support transit in a pedestrian-oriented design. 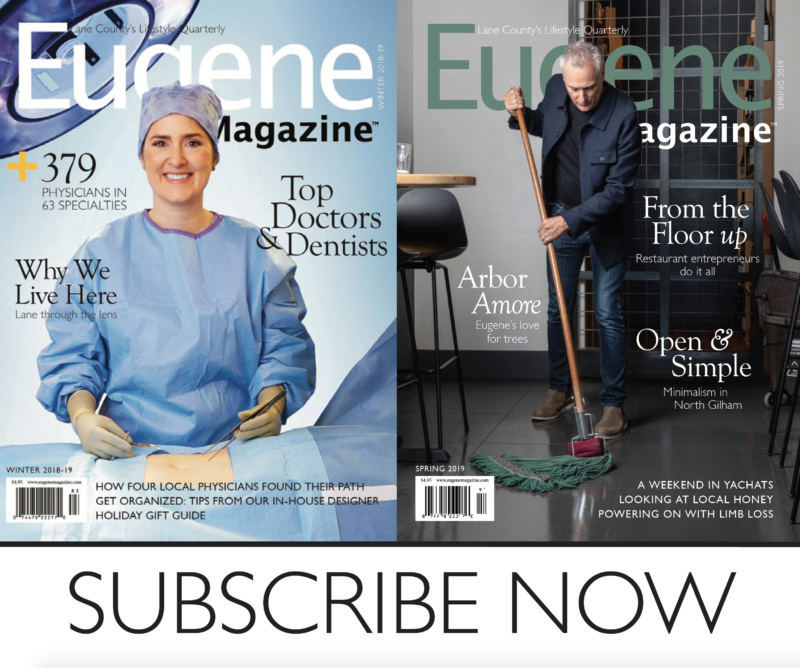 “Eugene is growing and changing in many ways, and the city has truly embraced what Crescent Village stands for: a pedestrian-friendly community with wide public sidewalks, small stores, open-air cafes, sustainable buildings, and park-like gathering places—plus easy access to mass transit, bike paths, and primary thoroughfares,” says Bishow. This new urbanism and smart growth movement is about creating a sense of community instead of the seclusion that often comes in a suburban location, where people often commute to work and back without engaging with their neighborhood. “It’s about creating urban places with strong social, cultural, and economic networks in an environmentally sound manner,” says Bishow. It’s also recognized as the first master-planned urban village in Eugene, designed by award-winning architects who really wanted to meet the demands of the community and its neighbors. Find out more about Crescent Village at crescent-villageeugene.com or visit the village on Shadow View Drive for a day of shopping, eating, and mingling with locals.